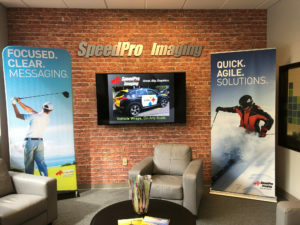 Choose SpeedPro Imaging as your advertising and promotions partner when you need wide-format graphics. We’re an independent Studio in Pittsburgh, PA, that is backed by 23 years of combined print industry experience and a national brand you can trust for quality. Our large format printing services are a great solution for trade show displays, car wraps, and outdoor signs for businesses ranging from marketing agencies to manufacturers and many more! If you want to stand out from the crowd, we’ll help bring your vision to life. Our studio is very involved in promoting local businesses and organizations. We work hard to draw interest from beyond the immediate area through our memberships in Visit Pittsburgh and the Butler County Tourism and Convention Bureau. Our aim is to solidify your brand in a tangible and lasting way. We’ll get your company noticed and help your customers remember you. We’re not just any print studio; we believe in creating an ongoing, cooperative atmosphere between our creative team and our clients. We specialize in crafting eye-catching marketing and advertising materials that are timeless and memorable while achieving amazing results. Our studio uses high-quality materials on each and every project, and your satisfaction with the finished product is our main goal. Have your product or service noticed with help from SpeedPro Imaging. Our goal to make you look good. Contact us to arrange a personal consultation and learn about the advantages of large format printing services for your organization. SpeedPro is conveniently located near Route 19 and Rochester Road in Cranberry Township. We serve the Greater Pittsburgh Area, including the North Side, Beaver, and Butler Counties.